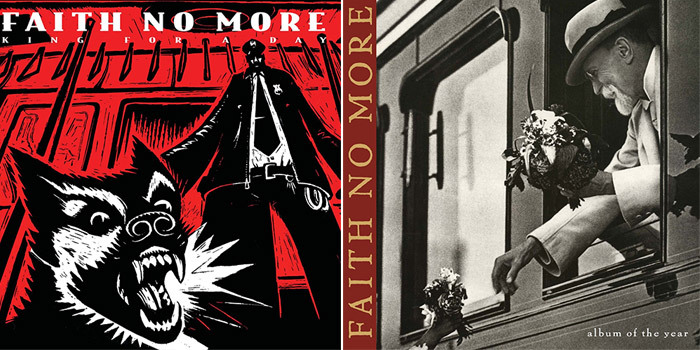 Last summer, Faith No More treated fans to Sol Invictus, the group’s first new studio release in almost 20 years. This year, the band will revisit two classic albums with Deluxe Editions of King For A Day and Album Of The Year on September 9th. Each album will be available as a two disc set that includes the original release accompanied by a second disc filled with rarities related to the album for a list price of $19.98. In addition to the CD set there will also be a double LP, 180-gram heavyweight black vinyl format of each album, featuring the remastered original, along with rare bonus tracks, many of which are making their vinyl debut, for a list price of $31.98. Among the eight bonus tracks are the B-sides “Spanish Eyes” and “Absolute Zero,” as well as the band’s cover of the Bee Gee’s “I Started A Joke,” which was originally released as a b-side in 1995, and then as a single in 1998. Album Of The Year‘s eight bonus tracks also include live versions of the album track “Collision” and the Burt Bacharach and Hal David classic, “This Guy’s In Love With You,” plus rare mixes of “Last Cup of Sorrow,” “Pristina” and more.